To search for specific text on a page choose Edit > Find. Suffolk is the location of the second main area for PASK, PASKE, and PASQUE families. The main progenitor in Suffolk is John PASK, who married Mirabel SPARROW on 11 November 1708 in Wickhambrook, Suffolk. A descendancy chart showing 11 generations is available. In the narratives section, the icon indicates John's descendants. Another progenitor is Peter PASK (1739-1821). He married Catherine FROST on 6 December 1764 in Ridgewell, Essex. They lived in Kedington which is on the border of Suffolk and Essex. A descendancy chart showing 9 generations is available. In the narratives section, the icon indicates Peter's descendants. John PASKE who lived at Stragwell, is also an early progenitor although little is known about him. His son John PASKE married Mary GOLDSBOROW, and they lived at Cambridge, Cambridgeshire. The icon indicates descendants of John Paske. Descendancy charts for other Suffolk families are listed in the charts section. Sincere thanks to co-researchers for contacting us and sharing their research, in particular Edwin Proctor, Dorothy Pask, and Jo Pask. You can find co-researchers listed in the citations for the individual narratives. The Master Place Index details all people in all locations. To search for the country, city or town choose Edit > Find, and specify the location. A searchable database of births, marriages, and deaths in civil registration is held and maintained at the Guild of One-Name Studies archive. Note: Some registration districts may include towns or villages from surrounding counties. 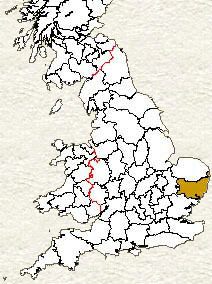 Further details on Suffolk and these registration districts are available on Genuki. This page may be freely linked to but not duplicated in any fashion, wholly or in part, except for private study. For data protection reasons, information of living persons is not included, unless permission is given. It must be stressed that this information cannot be guaranteed 100% accurate and any errors will be happily corrected.